Being here in Uganda, I have lost a great deal of faith in large NGOs and foreign aid. While I am still (and always will be) learning about international development, my time as a Peace Corps Volunteer has helped me to see the harm which can come from international donors, and has me questioning almost every type of foreign assistance currently being provided. I apologize if this post comes across as overly negative, but this is a huge problem here and I can’t emphasize the importance of how these issues are impacting Uganda’s future. One of the biggest problems I see is the mentality of people here in regards to how they see themselves and their communities, which I believe mostly stems from the large influx of foreign aid into Uganda. The mindset is one of powerlessness and dependency. Whenever I make a suggestion on a different way of doing things (like that the community work together to conserve their water supplies for the dry season, or even simple requests like starting a meeting on time) people say things like, “We Africans can’t do that. Black people don’t behave that way. Our problem is…” For instance, many of the most successful and lucrative small businesses, such as supermarkets, are owned by Indians, which many Ugandans chalk up to Indians being “business people” and alluding to the idea that Africans lack some natural ability to run good businesses. I don’t know if this mindset is a product of lack of education, foreign aid providing everything, having the perception that all white people are rich and all black people are poor, being told they are “poor uneducated Africans” making them believe themselves to be at the lowest rung of society’s ladder, or a combination of a variety of factors, but this mentality is very troubling. In fact, I would hazard to guess that this is a major reason the much of Africa continues to lag behind most other parts of the world in terms of development (the word “development” has a different definition for everyone, and there are countless books that try to define exactly what “development” is, but here I use it to refer to indicators of human rights and quality of life, such as life expectancy, access to health care and prevalence of communicable diseases, literacy and education rates, access to clean water, etc.). Rather than trying to solve problems themselves, Africans have been told they are poor, they are uneducated, they need the help of Westerners to make their lives better, etc. so many don’t even try to improve their lives without outside help. Many even describe an epidemic of laziness stemming from being given so much from outside. Why would anyone work to improve their lives when they can just get a handout? 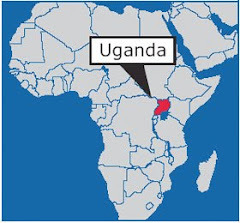 As several people have pointed out, Uganda (and many other African countries) has plenty of natural resources, land for cultivating, enough rainfall, good soil, mineral wealth, etc. but yet people go hungry and live in poverty. One Indian man who has been living here for 5 years boiled it all down to laziness. When a Western donor comes to visit to check things out, the local branches of the organization he/she is funding of course rave about their work and make it sound like they’re doing amazing things, sometimes even lying about activities – and it makes sense when you realize that the very well-paid jobs held by staff members of these organizations would be jeopardized if the donors realized how ineffective many of their donations have truly been. Yes, we always talk about ourselves and our work in the best way possible (I’m also guilty there), but it is commonplace for NGOs to blatantly lie about programs they have been conducting so that the aid money keeps coming. A lot of money seems to be spent on paying a driver to lug around “field officers” in a shining white SUV, spending an exorbitant amount of money on a vehicle and fuel that could be instead shunted to community projects. For example, my organization drives for hours every day to conduct field work because the staff members live in a major urban center more than 1 hour away from the catchment area of their projects. I also feel that foreign aid contributes to corruption, even down to the level of the individual within society, due to the huge influx of money that everyone wants to get their hands on. Community members sometimes don’t attend educational events hosted by my organization, such as workshops about HIV or malaria, if they know they won’t receive something tangible (a soda, lunch, or just plain money) in return, and villagers know how to beef up a budget proposal for their community-based organization (CBO) to get more money than they actually need for their operations – some of which ends up spent on new clothes, alcohol, school fees, soda or street food, etc. While things like school fees and clothing are needed by the local people, it doesn’t mean that lying about the allocation of funds, and thus using corrupt practices, is acceptable. 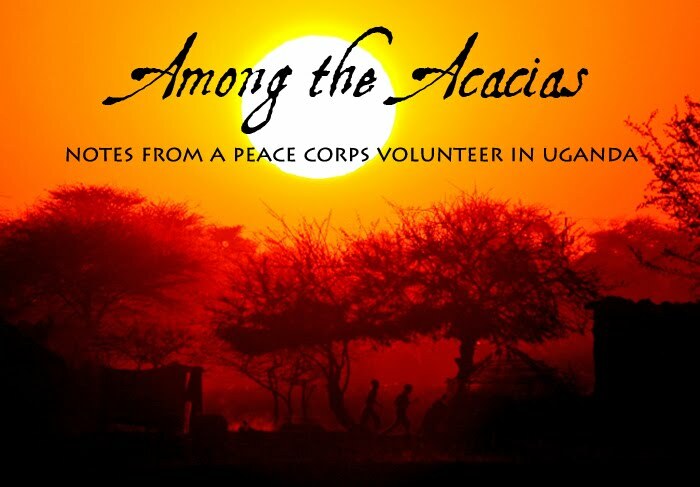 Several Peace Corps Volunteers who are working for NGOs have complained that budget proposals sent to international donors are blatant lies or include figures which the organization has purposely padded and made no attempt to make cost-effective. For example, we asked some community members to draft a proposal for funding a fruit demonstration garden. Their original proposal suggested far more plants than could fit on the land where they want to grow them, budgeted about $350 to transport seedlings from Mbarara when we already have most of the seedlings in our nursery bed here, and asked for a very large salary when these workers are volunteers and are working for their own benefit and the improvement of their own community. Their original proposal called for $4,677, while my supervisor figured we could meet all our objects for about $1,200 (which is probably still more than is necessary). A lot of community projects fail because when a project is started to generate income for the community/NGO, someone ends up pocketing at least some portion of it. Maybe it’s impossible for me to understand the type of desperation that comes from poverty due to lack of personal experience, but the level of dishonesty when it comes to money in almost every situation in Uganda astounds me. We’re currently trying to come up with some income-generating activities that the community can do to continue The Hunger Project’s programs after we pull out (each Epicenter is only supposed to receive 5 years of external support before being self-sufficient) but I’m realizing that there is absolutely no way to prevent the committee leaders for our programs from pocketing any income for themselves – and based on what has happened at other Epicenters, this is exactly what has happened. I simply don’t know how to function in a system with such an overwhelming level of corruption from top to bottom. Yes, there’s corruption in the U.S., but not nearly to this extent. African society is considered more community-oriented than in the U.S., yet a lot of the things I see happen are very individualistic. For example, we have tried to start a vegetable demonstration garden at our Epicenter before but people have always stolen the vegetables. Taxi drivers and shop owners are always trying to rip people off, and not just the muzungu who they assume is rich – fellow Ugandans, too – and they can do it because there are few price tags here, you just ask how much something costs and have to know whether it’s a fair price or not. Theft is very common here, and one house in my village was violently broken into during the night when the thieves knew the homeowner had sold cattle that day and had 1.5 million shillings (about $650) in his house. He and his wife were beaten badly and took a long time to recover. I can’t even leave things like my buckets or towels outside overnight because someone is likely to take them. There are certainly aspects of society that demonstrate how much Ugandans care about the greater community – people greet everyone, my neighbors get worried if I don’t come out of my house all day, and I recently attended a funeral where well over 500 people were in attendance because everyone attends, not just the people who knew the deceased. However, a lot of what I see is counterintuitive to what I would expect to see in a community-oriented society. Another thing I don’t really understand (and that is not completely related but I want to discuss it) is poor job performance. When it comes to government “public servant” jobs, there is no accountability because everyone is on a permanent pension and virtually nobody gets fired. Another Peace Corps Volunteer works at the District Health Office, and a co-worker of his remarked that in 16 years of working for the Ministry of Health, they’ve never known a single person to get fired. Thus, poor job performance is rampant, not only among health care workers, but in every position in Ugandan society. Nurses show up to work hours late and leave hours early, forcing patients to wait a long time for health care, sometimes until the following day. Secretaries fail to deliver important messages. Groundskeepers simply don’t show up for work, yet are still somehow paid. I continue to be amazed at the quality of “customer service” here – almost all shopkeepers, hotel staff, waiters, etc. give off the attitude that you, the customer, are bothering them and they wished you would just go away so they can get back to their nap. Such job performance would never be tolerated in the U.S., so I simply can’t wrap my head around why in Uganda, where the unemployment rate is astronomically higher, employers continue to put up with this when so many other people would be available to fill the position. A big part of the equation is low salaries, but with the level of poverty here, even a low salary is something worth working for. Despite all this, I still believe that people have a moral obligation to help other human beings who are suffering or in need. So how do we help developing countries without squandering money in ways that are ineffective and actually create problems of their own, like dependence on outside resources? One way is investment. If foreign investors spent their money on rewarding good Ugandan businesses and encouraging entrepreneurship, rather than just donating things and money, we would get past a huge host of the current problems, including fostering creative approaches to ending one’s one poverty rather than waiting for an outside handout, and creating a sustainable way to boost the local economy. However, as a Peace Corps Volunteer, I’m struggling with what kinds of solutions I can bring to the table as just one person (along with other PCVs and my community). Like I mentioned earlier, I am still learning and am trying to get my hands on books such as Dead Aid: Why Aid Is Not Working and How There Is a Better Way for Africa by Dambisa Moyo. Friends have raved about this book and I’m hoping to read it soon, as well as similar books, to help flesh out my new perspective on foreign aid. I spent Easter in my village and went to church with my neighbors. The service was long but had music and dancing. The best part was that they had a translator so most of the service was given in both Runyankore and English – otherwise, it would have been a painful 2.5 to 3 hours of not understanding much at all. A young woman from the area was launching an album so gave a “concert”. The music and dancing were good but the girl needs to learn how to lip synch better – it was very obvious she wasn’t singing. I entertained everyone during one song by getting up and joining the dancers on stage. Afterwards, we came home and I ate lots of local foods with my neighbors for dinner (matooke, sweet potatoes, millet, and some very tough beef. Even Gertrude, my neighbor, said the beef was tough, and when a Ugandan comments on the toughness of the meat, you know it’s really tough. And they wonder why I rarely buy meat in this country…). 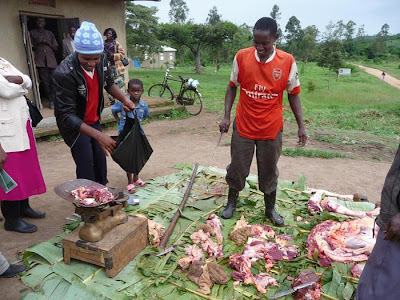 Villagers buying beef the day before Easter. They slaughtered 4 cows that day, and they sell the meat by the kilo by just hacking away with a machete – no such thing as real cuts like sirloin or T-bone steaks here. 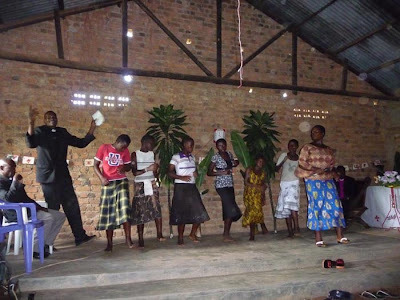 Easter church service with music and dancing. Even the pastor gets into it. A couple of weeks ago, we hosted a World Malaria Day event at my site. 5 other Peace Corps Volunteers came to help out, and the day included music to draw people to the event, lessons about malaria transmission, prevention, and treatment (some of which was taught by yours truly), speeches by local government officials, a youth poster contest, and a raffle for several mosquito nets and a bottle of insect repellant. Although I had worked hard preparing for the event, I decided that morning to have no expectations so as not to be disappointed if we had a low turn-up (a survival mechanism I’m learning to have in Uganda – be pleasantly surprised if things work out) but was very happy when over 225 people showed up for the event. The District Health Officer was our guest of honor, and he was very impressed by the size of the crowd and wants to help us do more health events like this around the district. The event lasted far longer than I ever anticipated – speeches from every local government official imaginable, guest speakers showing up 3 hours late, etc. – but everyone deemed the event a huge success. 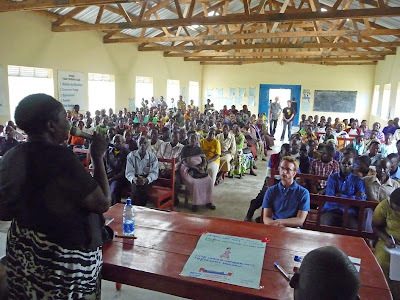 While I really enjoyed planning and hosting the event, and acting as the country coordinator for all the Peace Corps events for World Malaria Day in Uganda, I was very glad it was over because of how much work and time it had taken to prepare for the day. The next day was my birthday, April 28. The actual day was spent in the village, and was lazy in a wonderful way. Some of my Peace Corps friends were still at my house (including my friend Jesse, whose birthday is also April 28! ), so we had French toast, watched a movie, then just chilled all day. For dinner, my friends Gertrude and Janephur cooked us millet, posho, and g-nut (peanut) sauce. The food was nothing out of the ordinary but the gesture was so nice. The following day, I went to Mbarara for the weekend to meet new PCVs, who had just finished training and moved to their sites around the southwest, and to celebrate my birthday. I enjoyed a few days of eating good food, watching the royal wedding (everything looks even fancier when you live in an African village), lounging at the pool, getting a full-body massage, buying a ton of clothes at a big weekly market (4 skirts, 2 shirts, and a cardigan for about $11), and dancing with friends at a popular nightclub, Heat, which is outdoors and has fire pits and music videos playing on big screens. 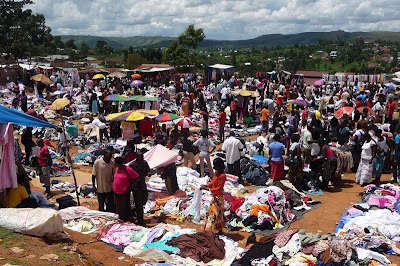 The weekly market in Mbarara where I bought way too many clothes. Shirts go for 20 to 50 cents, so a shopping spree here isn’t quite as expensive as in the U.S., and since Ugandans don’t know the good American brand names, you find shirts from The North Face or Banana Republic for the same price as everything else. However, that Friday also marked the biggest riot that has occurred since demonstrations began in Kampala and other cities several weeks ago for the “Walk to Work Campaign”, which the opposition is heading to protest rising fuel and food prices. Downtown Kampala had tires burning in the streets and riot police everywhere. One of my Peace Corps friends was on a bus in central Kampala during the riots and described a scene of pure chaos, saying that no vehicles were entering the city and taxis and buses were all heading away from downtown as fast as possible, even without passengers. A man almost threw a brick at his bus until the driver made a pro-opposition hand gesture. Despite this major riot, during which time the main opposition leader, Dr. Kizza Besigye, was seriously injured by police and has been recovering at a hospital in Kenya, things have been fairly peaceful since, and all PCVs are safe. I’ve continued teaching at Kyera Agricultural Teaching College, and last week was my lesson on goats and sheep. When I asked the students what a female sheep is called, they said “Eee-way”. I wrote “ewe” on the board and explained that it is pronounced “you”, but only later realized the irony – the word for “you” in Runyankore is “iwe”, which is how they were pronouncing the word for a female sheep. Maybe they’re right after all. Also, although I regularly watch movies with Ugandans, probably the most entertaining movie-watching experience happened when Jesse and I showed the college staff two extreme sports videos. The first was of our training group’s white water rafting trip on the Nile. Whenever a boat flipped, they would matter-of-factly exclaim, “And now you die!” with the typical Ugandan noise of disbelief and amazement “Eh eh eh eh eh eh…” They just couldn’t believe people actually do such things on “water which is like smoke.” Hilarious and made me realize how crazy white people really do look sometimes. We followed that with a video of really extreme skiing that even amazed me, which produced many more hilarious comments from the Ugandans. My house has suddenly been raided by mosquitoes and is a buzzing hotbed of the bloodsuckers every night. I’ve taken to walking around my house for a good 20 minutes or so before going to bed just killing mosquitoes by clapping my hands together or slapping them against the walls. Kibo watches me while this happens with wide eyes and a confused expression, and I can tell I look crazy and slightly disturbed during this now-nightly ritual. I’m hoping that the coming dry season, my recently-cleared compound (it had tall grasses before which can harbor mosquitoes), and the fact that I now kill 5-20 mosquitoes every night will soon get rid of my problem. I’ve started calling everyone who calls me muzungu either black guy or omweraguju, which means black person in Runyankore. A lot of times they don’t really know how to react and are stunned into silence, but others around them always laugh. It’s difficult to explain to people that where I come from, it is racist to call someone by the color of their skin, so if they don’t like being called “black guy”, they shouldn’t call me muzungu. I also made an entire taxi full of people laugh (again – this always happens), but this time because the driver tried to get me to take aboda boda (motorcycle taxi) past a police checkpoint because I had been sharing the front seat with another woman and it is illegal to have two passengers in the front seat (even though they often squeeze in three). People laughed when I vehemently refused and told the driver I would not help him do something illegal, but if all passengers would refuse illegal practices, the roads here would be so much safer – however, nobody ever seems to stand up against overcrowding or bad driving. I began a health education series for mothers at our child immunization outreaches. Our first session discussed family planning options, including a condom demonstration using matooke (a green banana/plantain) which always makes everyone laugh. The lesson was only about 15-20 minutes but I feel it was effective, and afterwards at least one woman asked for a Depo Provera injection. Feels good to see results from my work! I’m also planning on doing a women’s health day next week with information about family planning, HIV and STIs, pregnancy and breastfeeding, and menstruation, including selling Afripads, a low-cost reusable menstrual pad that saves girls and women a lot of money, keeps girls in school (many stay at home during their periods because of embarrassment from using towels, rags, feathers, etc. when they are unable to afford a pack of Always), and is environmentally friendly. I officially ate the first thing I have grown myself – green beans from my garden! Amazingly fresh and delicious, and 100% organic. Maybe I’ll continue a garden back in the U.S.? Finally, one last interesting anecdote. I knew before that the people in my region, the Banyankore, are split into two ethnic groups, the Bahima, who are the prestigious minority who have traditionally been the cattle owners and therefore the group with money and power, and the Bairu, who were traditionally the agriculturalists and lower in society than the Bahima. President Museveni himself is Bahima. The two groups often look physically different, with Bahima people known for lighter skin and thinner noses (also, Bahima women tend to be very large! People say it’s all the milk they drink). However, what I was recently told is that these two groups are actually the same ethnic groups as the Hutus and Tutsis of Rwanda, who are now famous for being the focus of the Rwandan genocide. The Bahima are essentially Tutsis, and the Bairu are Hutus, the difference being that they are now part of different language groups so have different names. I am going to try to write more frequent, shorter blog entries to make it easier on my readers. It doesn’t feel like very much happens here on a daily basis but when I sit down to write a blog post it always gets so long!